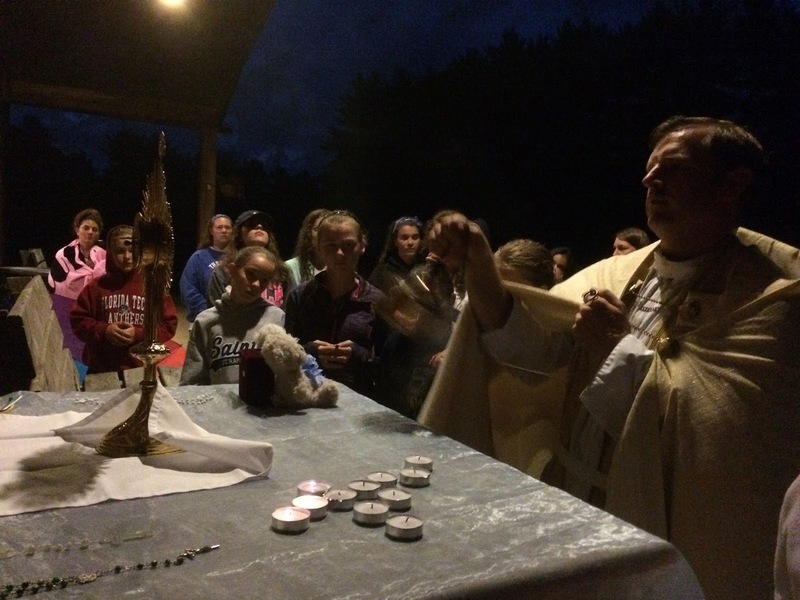 It was the last day of the Cinderella-themed Girls Summer Camp I was chaplain at last week in Wisconsin. The weather had been amazing all week long – gentle breezes, light and fluffy clouds, temperatures in the 70’s. But then came the last day. Severe thunderstorms vied with each other for the upper hand. Puddles formed everywhere. During a break in the rain, the four teams of girls had each set up and decorated an outdoor altar for our evening Eucharistic Procession. My proposal, as the rain beat against the windows, was to move everything indoors: “We can have a procession around the chapel,” I suggested. “Don’t worry about the rain, father. Someone will be holding an umbrella over you and Jesus,” answered one of the consecrated women of Regnum Christi, who were running the camp. And so we headed out into the rain. 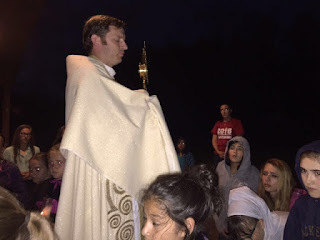 I carried the monstrance with Jesus inside, a camper held an umbrella over us, and three more campers went in front, two with candles and one with incense. Each of the altars had been moved under some sort of roof, but between each one we had to walk several hundred feet in pouring rain. “Pouring” is an understatement. It was really “driving” rain. An umbrella can’t stop rain drops that fall sideways. And I was the only one in the group of forty who had an umbrella! The girls who prepared the first altar had written their own prayers which they said out loud; beautiful, simple prayers. I could feel the smile on Jesus’ face. 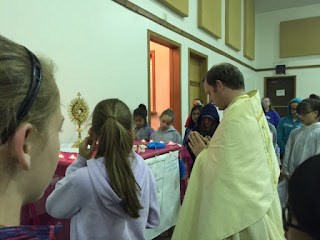 After, I gave benediction, tracing the sign of the cross over everyone with the monstrance. Then it was out into the rain again. We had to cross two fields and a road. It took a while just to find a place in the road where the puddles were less than ankle deep. Eventually we found one, but not until many feet were soaking wet. Arriving at the altar, placed under an overhang outside a gym, we again prayed and I gave the benediction. Again the girls read their prayers. 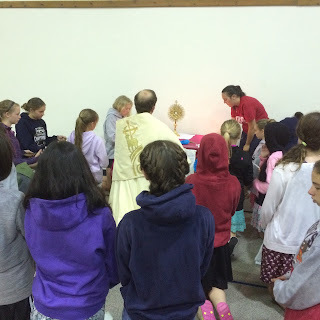 Then we headed into the gym for the third altar. At least inside the rain couldn’t touch us, but we still had one more altar outside, and there were those two fields and the road to cross back over again. Was I imagining things, or as we were stepping into the gym, was that a patch of clear sky in the distance? The fourth altar was under a gazebo. I set Jesus upon the altar and gave Him thanks for this most recent little miracle of His. Looking at the weather radar afterwards, it was like the storm had divided right above where we were, gone around us, and left us in peace. And it certainly was a peaceful night: the moon was out now and even one bright star glimmered down through the retreating clouds. The girls gathered close around the gazebo, and I could feel their prayerfulness and their gratitude too. I gave benediction, and then we headed back across the fields. And what was this – the storm was still there in front of us, dark clouds, flashing lightning and all – but now it only formed a beautiful backdrop to our procession. It was like all nature wanted to join us too. And I had wanted to stay inside! 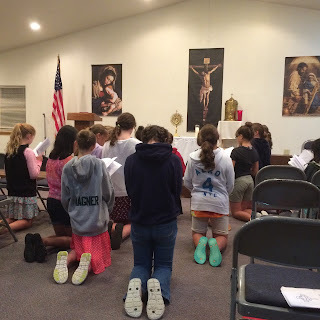 We returned to our chapel and the girls took turns all night spending time with Jesus in Eucharistic Adoration. “Five and a half hours,” she said with a smile. “How long did you sleep?” I asked, trying not to choke. “Oh, four hours,” she replied without skipping a beat. I would have rather she slept a bit more, but she spent that time in adoration of her own free will. I don’t think I’ve ever gone that long, and I’m a priest!!! This was just one little part of a blessed week, a week in which I was “Blessed among women.” :) We prayed, sang, did archery, canoed, rode horses, had a talent show, did arts and crafts, and so much more. I wholeheartedly agree. And I got to come and rest and be at peace all week long with Him!